It should come as no surprise that these nine once unknown volcanic islands have made it to the top of our travel bucket list. So, if you’ve ever (or never!) considered a visit, why not check out Out Adventures’ upcoming Portugal Azores Islands Adventure. 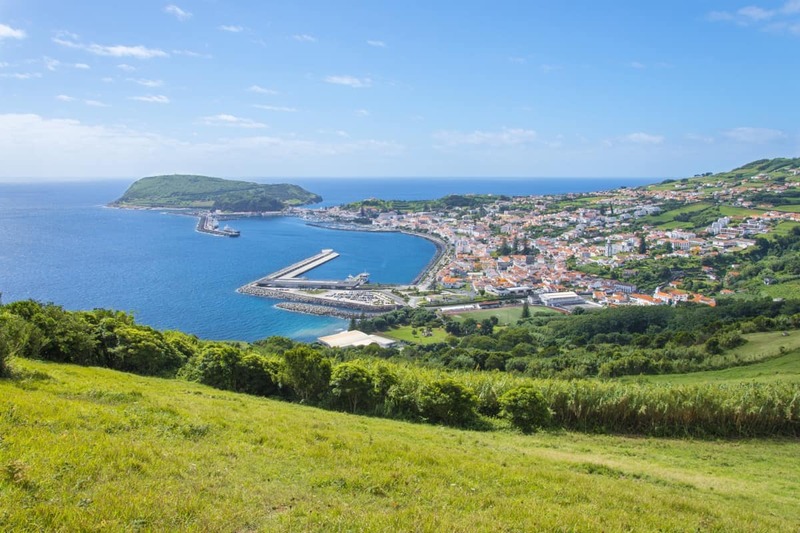 The all-gay expedition traverses four of the islands, hitting major sites like Sete Cidades and Capelinhos as well as partaking in popular activities like whale watching. Being adventure enthusiasts, we’re particularly keen on the range of physical activities featured on the tour like the afternoon spent stand-up paddle boarding on a crater lake. Special offer! You can save up to $200 on all OUT Adventures trips when booking online. Click here to get your special discount. But enough about our wanderlust. 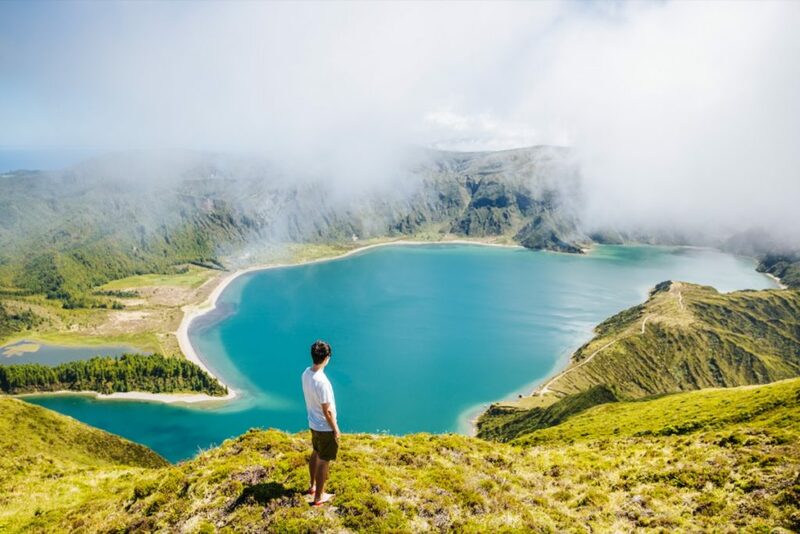 Read on for 8 reasons why The Azores Islands are Portugal’s best kept secret. With a warm year-round climate, plenty of sun and fertile soil, the terroir on these unique islands is ideal for coffee, bananas, passionfruit and other tropical produce. 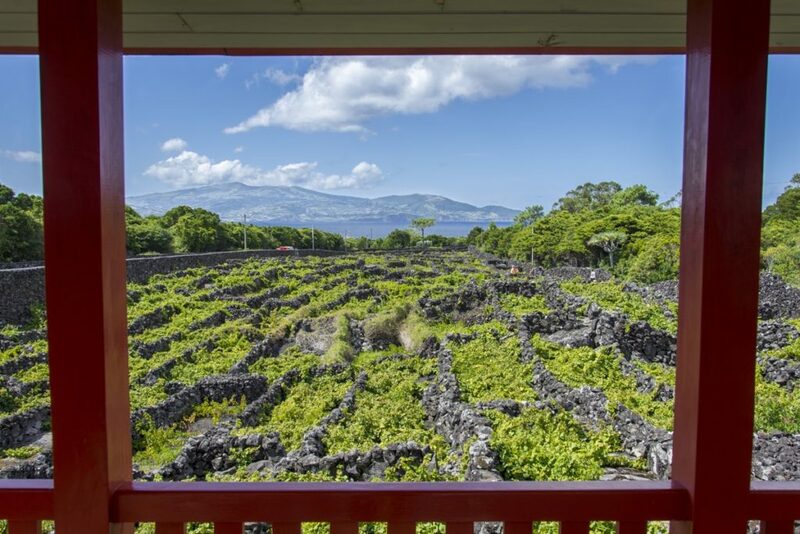 Cows grazing on the endemic flora produce internationally awarded cheese while the UNESCO World Heritage vineyards on Pico Island are known amongst oenophiles for their fruit forward vintages. In other words, the Azores are a foodies dream destination. Bom dia! Wake up to some of Portugal’s best boutique hotels and accommodations. As a destination still finding its feet, the Azores Islands haven’t been polluted with massive resorts. Rather, each island has a series of sensational small hotels and adorable homestays. Some accommodations such as the award-winning Terra Nostra Garden Hotel featured on Out Adventures’ tour even have exclusive private thermal pools heated by the volcanic activity below! See #3 for more about these thermal baths! While there’s plenty to do on land (hiking, biking and horseback riding) and in the skies (paragliding anyone? ), the Azores really shines on the water. Grab a paddle and hit the crater lakes aboard a kayak, canoe or SUP board. On the coast you’ll find intrepid surfers riding Europe’s best waves. You can even try your hand at sailing, deep sea fishing or canyoning. 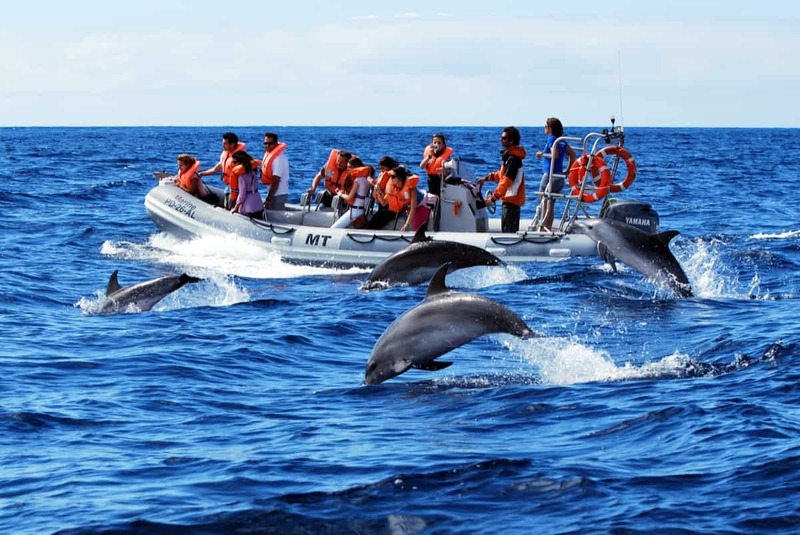 Speaking of water sports, The Azores is an important site for ocean life and as such has become a sanctuary for over 25 species of cetaceans. No trip would be complete without a whale watching tour. Expeditions range in size from small zodiacs to mid-sized vessels. One of the easiest ways to take in the island’s verdant countryside is with a good ol’ fashion hike. 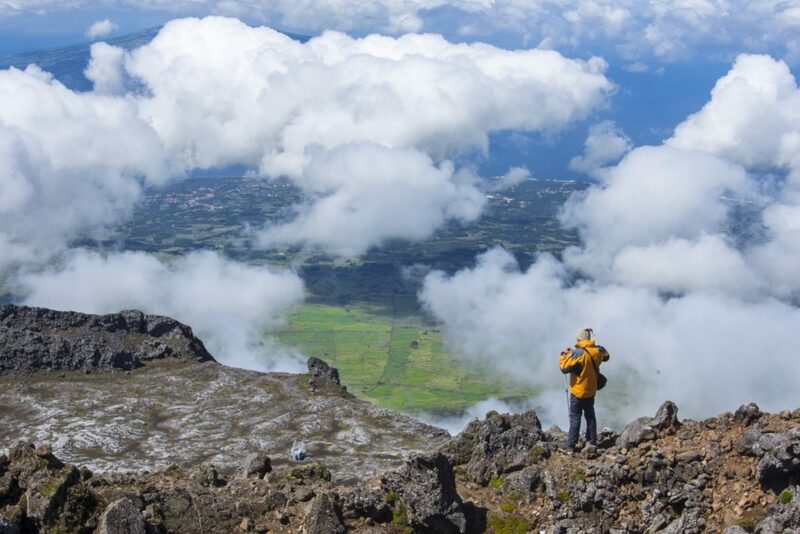 The islands feature plenty of well marked paths including an epic ascent up Portugal’s tallest mountain, Mount Pico. 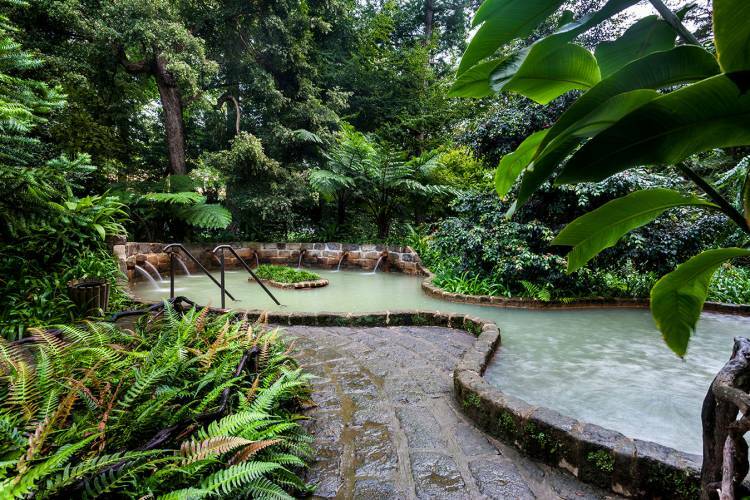 After a long day hitting the trails, slip into a naturally heated thermal pool. These small bodies of water are heated by the hidden volcanic activity below. Note: the baths are found throughout the islands. Some are mere pools, only discoverable when accompanied by an in-the-know local. While others are well equipped affairs with small entrance fees that cover amenities like towel service and showers. Stealing second place on this list is the welcome relief of privacy. Because the average traveller is still blissfully unaware of the Azores, the hordes that flock to similar destinations (read: Hawaii) are noticeably missing. Of course, this will likely change as the world’s travelati boast about the Azores beauty on Instagram spurring an influx of visitors. To round out this comprehensive list, we wanted to take a moment to simply appreciate the natural beauty of this unspoiled region. Each island comes with it’s own fantastic vantages featuring slews of caverns and coasts, mountains and mudpots. Its famed calderas are postcard worthy while it’s pristine beaches rival anything in the Caribbean. Small cities oozing charm pepper the islands. And at day’s end look westward for fiery sunsets that need no filter. In summary, the Azores are #paradise. Longing for an Azorean Adventure? Out Adventures is the only gay tour operator running group excursions through the Atlantic Archipelago. Pack your hiking boots and join their inaugural adventure September 6 – 13, 2019. If you want to extend your holiday in Portugal, consider also signing up for their Portugal: Lisbon & Porto Gourmet Foray that directly follows this tour. See you in the Azores! Note: This article was written in partnership with Out Adventures, however rest assured all opinions are 100% our own and we would never sacrifice our integrity for a sponsorship.